In a large bowl mix together 2 1/2 cups of the flour, salt, baking powder, baking soda, and sugar. Cut the butter into small cubes then quickly work it into the mixture (using your fingers) until it resembles a coarse meal. In a small bowl, whisk together the egg and sour cream, then add to flour and butter mixture. 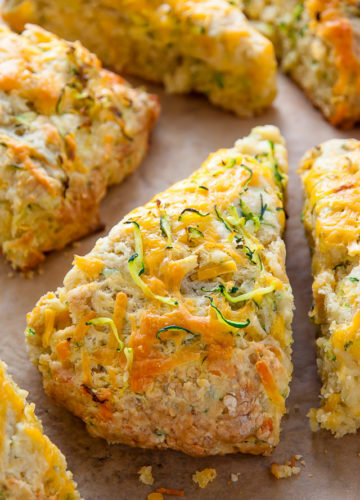 In a small bowl combine remaining tablespoon of flour, grated zucchini, and a 1/2 cup of the cheese; toss to coat, then add to the scone mixture; gently fold them into dough with a spatula until combined. Pour the shaggy dough out onto a clean, floured work surface and shape the dough (you will have to work/knead it quite a bit to get it together) into an 8-inch circle. Cut the dough into 8 wedges and carefully transfer them to the prepared sheet. Sprinkle the top of each scone with a little of the remaining cheese.